Marcel Proust found his time machine in that little sponge cake called a Madeleine. For me, time travel comes from a nibble of fresh, uncooked rhubarb. Steamed rhubarb is nice, especially with yogurt, and I adore rhubarb crumble. But neither holds the power of rhubarb eaten raw: one tiny bite, and I’m instantly transported to the back porch of our old house on Musgrave Avenue. There I sit, a stick of fresh rhubarb in one hand, and in the other, a small cup of white sugar for dipping the rhubarb. Ah, bliss! Of course, with what we now know about the toxic nature of sugar, giving a three year-old this snack might be considered more like child abuse than kindliness today. But heck, it was the 1950s and sugar ruled. Nowadays the rhubarb time machine works perfectly for me sans sugar – a nibble of rhubarb au naturel is all that’s required to fuel the journey. I will admit, however, to using honey and brown sugar when I make a rhubarb crumble. If you are on Gabriola Island from now through September, I hope you’ll visit the Silva Bay Restaurant & Pub to enjoy a great meal and to check out my “Inspired by the Coast” show. Over 30 of my marine and coastal prints are on display. 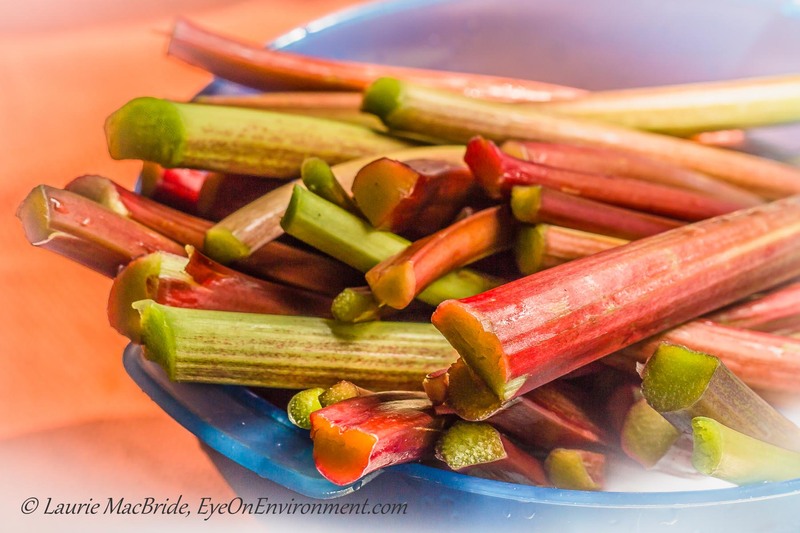 Posted by Laurie MacBride, Eye on Environment on May 25, 2014 in Musings on Life and tagged food, memories, photos, rhubarb, spring, taste, time. Hi Laurie: nice pic but I have never learned to like let alone love rhubarb. When I was a kid my mother grew bushes of the stuff but I avoided it completely much to my parents’ displeasure. I can manage a nibble of rhubarb pie occasionally but now I have an eco-reason to avoid it because it takes so much sugar to make it palatable for me. Thanks for the comment, Paul. I’m sure there are many other who dislike rhubarb, like you! Toxic sugar, eh? Rhubarb is toxic as well since it contains oxalic acid as well as one or more glycosides, especially in the leaves. Rhubarb also has laxative properties.The oxalic acid, and especially malic acid, is what makes it delightfully bitter. Apparently, in this case, two wrongs make a right: toxic rhubarb and toxic sugar in a strawberry-rhubarb pie. You’re absolutely right about the oxalic acid, Herb – the same substance that gives spinach its bite, and sorrel its tartness. And malic acid is used in wine making, too. These kind of toxins, I can definitely support! Thanks for commenting. Thanks Sherry – I wish you could too (so that I could see you!). I’ll look forward to trying the recipe – hopefully I’ll get another couple of harvests from my rhubarb before it’s done this year. Enjoyed the rhubarb nostalgia! in the early 50’s my mom could make rhubarb into more things – most good, but we sure got tired of it! We had a lot of it and I am sure there was a lot of sugar involved too. Hi Laurie, congratulations on your exhibit. I would love to visit Gabriola Island sometime. I also love rhubarb, and having recently given up sugar, I wondered if I would ever be able to eat it again. I’ll try it raw as you suggest. Thanks, Kim! It would be fun to see you here on Gabriola. As for the unadorned rhubarb: you probably won’t manage more than a couple of bites – it’s pretty tart all by itself! What about an alternative sweetener, like brown rice syrup, or maple syrup, or perhaps stevia? Hi all, I think the sugar is mainly there as a sweetener but it does seem to add some viscosity as well. Combing through the internet I found one mention of Stevia and several substituting Spenda for the sugar. The Splenda website FAQs seem pretty reassuring regarding health and safety concerns. I will definitely try it. Considering how few ingredients there are in S/R pie it’s amazing how many variations there are on the theme. Back to the garden and laboratory . . . . Enjoy! As for me, I think I’ll stick with honey and brown sugar for my crumbles.